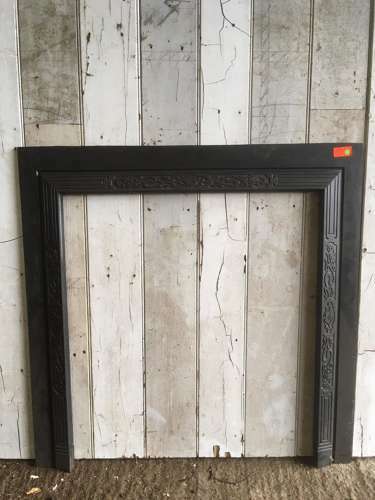 An elegant antique cast iron fire trim, suitable for surrounding a wood burner or fire basket. The trim has a pretty design with flowers, decorative patterns and attractive border designs. The trim dates to approximately 1920. The iron has been blacked and polished and has a quality finish. The trim is a reclaimed antique and has some slight signs of wear. There are some casting marks that can be seen and there are some rough edges and surface rust marks to the legs. The trim has some very small marks and knocks, please see pictures for details. The back has surface rust as expected. The fire is in good, solid and useable condition. The fire trim would add a great deal of style to a wood burner or hearth and is an attractive item with great character. Please note we have a very similar trim available for sale. Please see our other items for details.